If, for my first stage of Flexcit, I had written up the transitional agreement currently on offer to the UK government, it would no doubt have elicited exactly the same responses we're now getting from the "sell out" merchants. They've been squeaking all over the internet, and for very much the same reasons for which they were originally complaining – the vassal state schtick they said was the problem with the "Norway option". Now they are getting the "pay-no say" scenario that they thought they were getting but were not. And they haven't a leg to stand on. Having sabotaged any attempt to get a sensible resolution, they're lumbered with their own worst nightmare. If it was just them getting what they deserved, the current mess would be worth it. As it is, when Jacob Rees-Mogg and others board a boat and pass by Parliament throwing fish into the Thames in protest at the alleged "sellout", as they are promising to do, we might pray for a nautical disaster which has him following them into the Thames. Ironically, the price we will have to pay for the "transition" that Rees-Mogg has done so much to bring about is a settlement of the Irish question. That bill remains unpaid. The cannery has been kicked down the road again, with no proposals forthcoming from the UK government. The best the "ultras" can offer is stunningly ill-informed drivel from Snake Oil Singham (now of the IEA), technically illiterate, strewn with errors and false assumptions. Needless to say, it is given pride of place on the "ultra" noticeboard CapX - but as long as this sort of stupidity is given house room by the chatterati, there is little hope for us. Inevitably, nothing of Mr Singham's stupidity will have slightest impact on the Commission. And, in the absence of anything sensible there looms the infamous "backstop" whence, "the negotiators agree that a legally operative version of the 'backstop' solution for the border between Northern Ireland and Ireland, in line with paragraph 49 of the Joint Report, should be agreed as part of the legal text of the Withdrawal Agreement, to apply unless and until another solution is found". This is the 'backstop" that a certain Mrs May dismissed as "completely unacceptable", saying that "no UK prime minister could ever agree to it". It could, she said, undermine the UK common market and threaten the "constitutional integrity" of the country by creating a new customs barrier in the Irish Sea. But, not only has she caved in and is dumping Northern Ireland by apparently accepting something unacceptable, fishing also gets the "sell out" treatment. Had this travesty been proposed the day after the referendum, it would have been rejected out of hand. But now, it is been lauded as a "success" by our Brexit minister. We have got there by a process of attrition. A totally unprepared UK government has fed its negotiators into the Brussels grinder, the outcome of which was as predictable as sending raw troops over the top to face German machine guns in the first battle of the Somme. However, even the BBC in its TV news bulletins noted that M. Barnier had gone out of his way to point out that, "nothing is agreed until everything is agreed". The General Affairs Committee gets its bite today and then there is the European Council on Friday, which will probably rubber stamp the draft agreement. And then we're back on the treadmill. Despite that, the idiot Davis is drooling that we've taken a "decisive step" towards a Brexit settlement. Yet, can it really have escaped his attention that the Irish question was there at the beginning, and is still there? 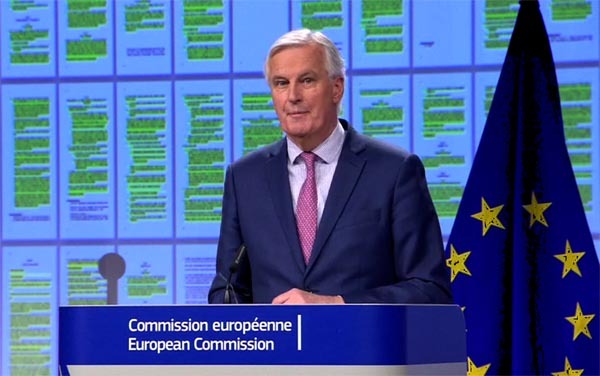 That reality is not going to conceal the drama of M. Barnier's presentation yesterday, where he stood in front of a backdrop and proudly declared: "What you see is green". From where he stood, you could hardly see the white – the areas where agreement has not been reached. And white, for this day, was Ireland. If it's reality, you're after, though, cut to the Independent. It has Jonathan Powell asserting that Mrs May's handling of the border question could bring the entire Brexit negotiation "crashing down". He accuses her of committing "the worst possible sin" of having "boxed herself in". Her Mansion House speech had "not solved the substantive problems" and, in his view, "her problems on Brexit may only just have begun". Right on cue, the Belfast Telegraph reports UUP's Nicholson saying that the backstop option for Brexit is "unacceptable", a position that will never change as long there is one Unionist MP left standing. The Scots, on the other hand, are wound up about fishing rights. Reuters tells us that the SNP has called the current deal "a sell-out" and a Conservative MP has warned that it would be easier "to drink a pint of cold sick" than sell it as a success. That is where it is going to get interesting. Mrs May will come back from her "triumph" in Brussels on Friday but, on the following Monday, will have to face the Commons with her report. It is unlikely to be a "frictionless" passage. Yet, the delusions persist – and doubtless will continue. From the very start of her tenure, Mrs May has evaded reality, made worse by being surrounded by second-raters who are trapped by their own stupidity. It seems impossible for her to break out. When it comes to the crunch, that has been the problem all along. This is not a society that can handle expertise, or one that has any respect for knowledge. And when a snake-oil salesman of the calibre of Shanker Singham can be taken seriously, his influence reaching to the the very heart of government, we are in very serious trouble. Even now, though, there is still time to take a different route. It is unlikely that it could work under this prime minister, though, so it is time for her to go. She has already secured her position as the worst premier this nation has had to suffer in living memory, so has nothing to gain by staying on. If by some miracle she was deposed before the current deal is separated, a new prime minister could perhaps go to Brussels and ask for an extension of time, sufficient for us to set a new course in the direction of Efta/EEA. But for that to happen, much of the dead intellectual wood surrounding the government needs to be put to the torch. Therein lies the real problem. If the prime minister is the pinnacle of stupidity, she rests on a huge base which will be almost impossible to shift. The rent-seekers have lodged their positions and are not going to give them up easily. Nevertheless, reality will eventually have its day. Whether on 29 March 2019 or some time later, the UK will become a fully fledged third country, whence all the stupidity will be exposed for what it is. A shock to the system is inevitable and it can hardly be less than profound. Out of the wreckage, perhaps, we might be able to salvage something, and start again. But until the stables are cleansed, we'll not be seeing much more of the "green" of which M. Barnier was so proud.